This photo was taken in Concon, a coastal town in Chile which is known for having great empanadas. 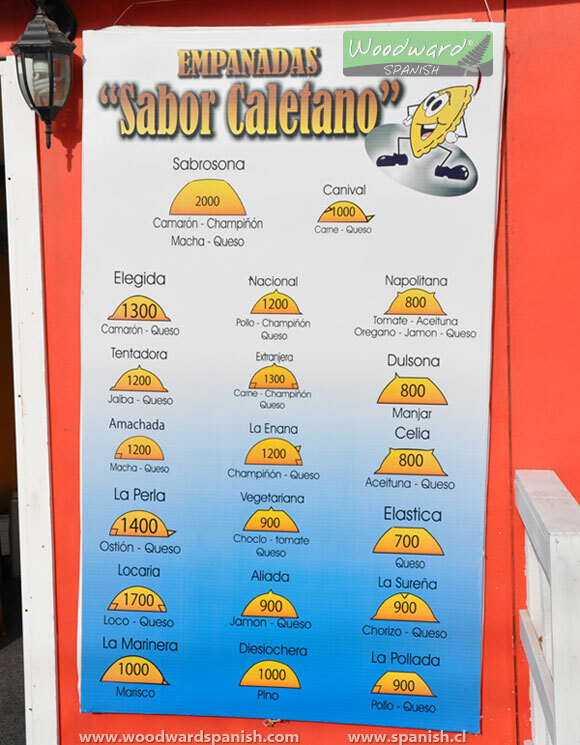 The numbers inside each empanada is the price of them in Chilean Pesos. If you would like to learn more about other Food from Chile, check out Typical Chilean Food. Before you look below, try and find the names of three of the empanadas which are spelled incorrectly. Just so you know, some of the empanadas have names which we have no idea why they were called that. They were most likely names made up by the owners of the empanada shop and are not necessarily common in other parts of the country or even city. At the bottom of the page you will find a Spanish / English translation of the main ingredients. We have also made additional comments about each empanada where we found it necessary. Sabrosona: Camarón – Champiñón – Macha – Queso. Sabrosona viene de la palabra sabrosa, que quiere decir que tiene buen sabor. Sabrosona comes from the word sabrosa which means tasty. “Canival” debería estar escrito como “Caníbal”, de alguien que come carne de la mismo especie. The name for this was not spelled correctly. Sometimes native Spanish speakers accidentally mix the letters B and V because the two letters sound the same to them. The correct word should be Caníbal which means Cannibal. Elegida means the chosen one (in feminine form). Nacional: Pollo – Champiñón – Queso. Napolita: Tomate – Aceituna – Orégano – Jamón – Queso. Tentadora quiere decir que es apetecible, deseable, que dan ganas de comer. Tentadora means it is tempting. Extranjera: Carne – Champiñón – Queso. Extranjera means foreign or foreigner. Dulsona debería estar escrito como “Dulzona” y quiere decir que es de sabor dulce. The name for this was not spelled correctly. Occasionally native Spanish speakers accidentally mix the letters C, S and Z because the letters sometimes sound the same to them. The correct word should be Dulzona which comes from the word Dulce or sweet. Amachada es un modismo usado para referirse a una mujer con actitudes y/o rasgos de macho (hombre). Amachada is slang for calling a girl a “tomboy”. They were playing with the word Macha which is a type of shellfish. La Enana: Champiñón – Queso. Enana se refiere a una mujer de tamaño pequeño. Enana means a female dwarf. What it exactly has to do with mushrooms and cheese I have no idea! Celia is the name of a woman. Maybe someone who works at the empanada shop is called Celia and it has something to do with her. La Perla: Ostión – Queso. Perla means Pearl. Strange considering Ostras (oysters) have pearls and not Ostiones (scallops). Vegetariana: Choclo – Tomate – Queso. This is the vegetarian empanada. No meat! Elástica se refiere a la elasticidad del queso derretido que es como un elástico. Imagínalo colgando desde la empanada hasta tu boca. Elástica means elastic. You can imagine a string of elastic-like cheese hanging between the empanada and your mouth and it stretching as you try and pull the empanada away to break it. Locaria es un modismo empleado para referirse a personas alocadas. Again, playing with words. Loco is a type of abalone (shellfish) and the word also means crazy! A locaria is someone who is (slightly) nuts. The typical name throughout Chile when you have Ham and Cheese together. La Sureña: Chorizo – Queso. Sureña, que tiene su origen en el sur. En el sur de Chile, el chorizo es muy común y de buena calidad. Sureña means it comes from the South. In the south of Chile it is common to find high quality chorizo (a type of sausage). Marinero means sailor (and marinera would be the feminine form). Probably an appropriate name for a seafood empanada. Diesiochera debería estar escrito como “Dieciochera” y se refiere a la fiestas patrias de Chile que celebra el día nacional el 18 de septiembre. This is another word spelled incorrectly with the common C vs S mistake for some native speakers. It should say Dieciochera from the number dieciocho (18). What is the connection between this empanada and the number 18? Well, the national day of Chile is on the 18th of September and one of the most common snacks during the Fiestas Patrias (National Day celebrations) is this type of normal empanada. La Pollada: Pollo – Queso. So, which empanada would you like to try? ← Are you embarrassed or pregnant?